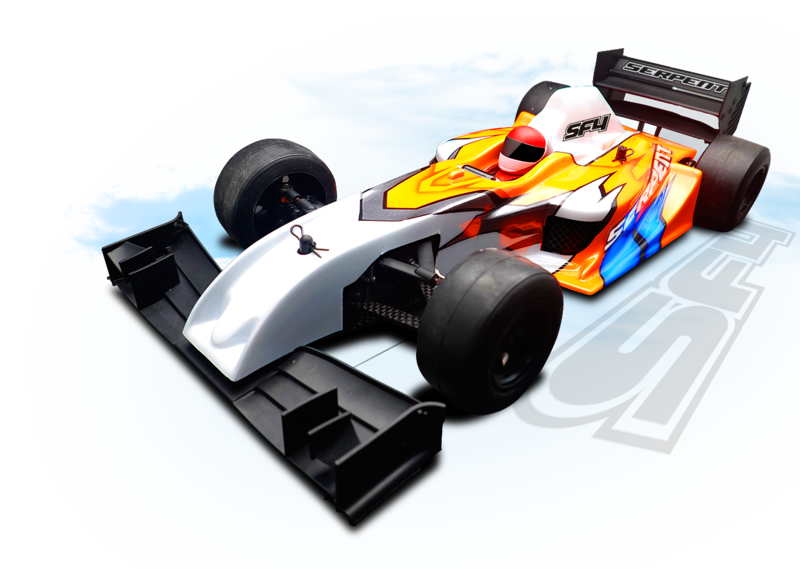 The F110 SF4 is a revolutionary innovative design on the 1/10th Formula 1 car market. Made from racers for racers. pod with side bearings in linear guides replacing the sidelinks. With a traditional sidelink design, designers use long side links to have the relative roll movement between pod and chassis as linear as possible. But no matter how long the links are, there is always a longitudinal component in the roll motion. With the new side-bearing design, the roll motion is completely linear and independent thus the cornering is completely independent from accelerating or braking. While it doesn’t change much on the mid corner handling of the car, this gives an unprecedented consistency and stability at corner entry when the braking and steering input overlaps and at corner exit when the throttle is applied before the steering is completely straight. with narrow chassis design. 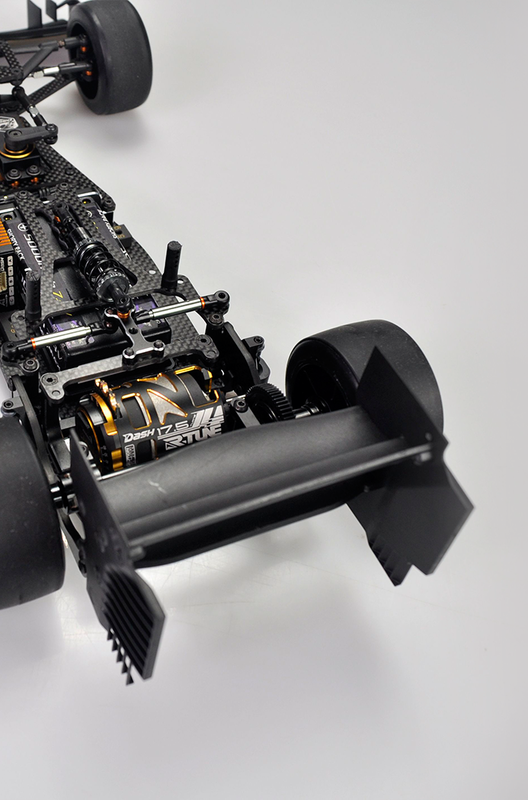 The new side bearing design opens the possibility to use both inline and cross lipo orientation while keeping a narrow chassis design. to prevent longitudinal flex and keep torsional flex on a reasonable level. 2 body mount positions are included. It does not need to be removed to exchange the lipo. 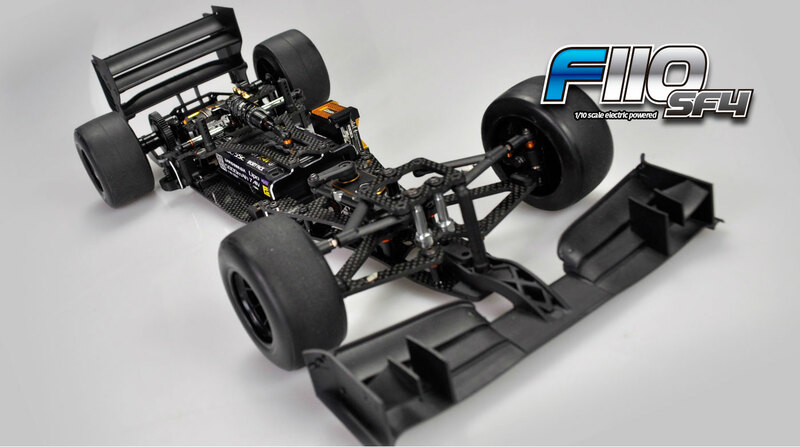 from the F110 SF3 is evolved with more width to increase the stability of the car, especially on corner entry. It also prevents traction roll effectively. 1-screw Lipo mount in all lipo orientations. For the inline lipo orientation, the lipo is held by an aluminium holder that can be removed though the chassis bottom. For the transversal lipo orientation, the lipo can be pulled through the side. This is possible thanks to the no-link design. No more excuses not to charge the lipo in the car. plate which works as front topdeck at the same time, preventing mutual influence between longitudinal chassis flex and steering. This leads to a new, very precise steering feeling. 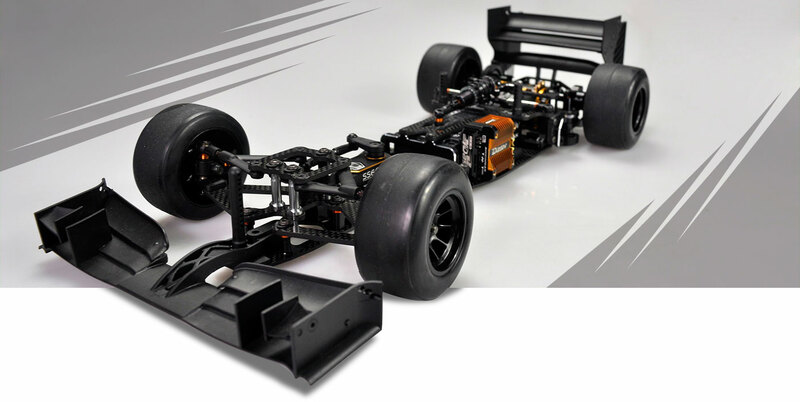 New wing mount which is independent of the rear pod movement. It is connected to the chassisplate via sideplates that run under the rear shaft and diff. This makes the suspension work much more like a independent suspension car by massively reducing the inertia of the pod. In addition, the angle of attack of the wing is very constant compared to the traditional design. It also allows to run more rear droop without making the car unstable during high speed cornering. New double short tube system for the rear roll damping. Compared to the single tube design, it gives a 100% symmetric driving feel. New ultra-low center of gravity rear pod. 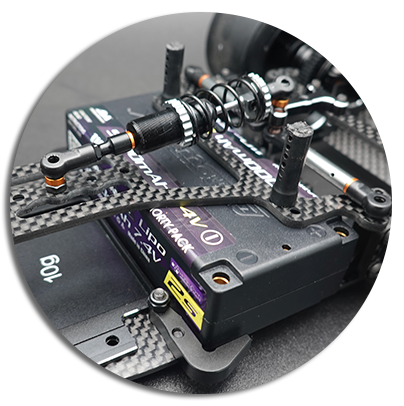 The angled rear plate gives torsional stiffness, protecting the rear shaft and bearings, while keeping all masses low in the pod. This increases rear grip of the car, and preventing grip roll in high grip conditions. At the same time, body touching with the pod is largely reduced. to keep masses as low as possible. They are positioned more to the center to reduce inertia. is completely new and innovative. Ride height and wheelbase can be adjusted very precise with shims. Rear shaft with variable diameter. With the traditional rear shaft design, aluminium reaches its limit when it comes to impact resistance. This leads to aluminium being not the usual choice for rear shafts. Also the right bearing is stressed far more than the left bearing. much easier to build, with same, bigger piston diameter as the Project 4X, and the Project 4X bleeding hole for easy rebound adjustment. Now we proudly present another Masterpiece of innovation and performance. Enjoy the assembly and feel the difference on the racetrack. 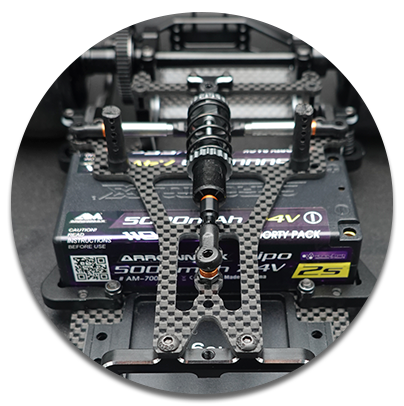 Symmetrical chassisplate for even flex and torsion in high quality carbonfiber with big cutouts for lowest possible electronics positioning. the car is consequently optimized for 2s shorty lipo use. The battery can be used in inline and cross configuration. In inline configurateion the electronics get placed besides the battery. For cross configuration there is a electronic holder included to mount the electornics in the center in front of the battery. The servo can be mounted in 2 configurations. Alu battery holder with lowered battery position for lowest possible center of mass. Battery can be removed from the car with only one screw. No more excuses not to charge the battery in a lipo bag. The battery can be addached to the battery holder with battery tape or velcro tape. The battery holder can be opened with one single screw and the battery can be removed and replaced on the side. This works to the left and to the right and gives total freedom for electronic placement. The shock internals are optimized to use a bigger diameter piston while using the same springs. The shock seal cartridge and piston are the same easy to use system as in the 4x evo. A bleeding hole in the bottom which is closed by tightening the lower balljointmakes rebound setting as easy as never before threaded shocknut with o-ring for safe and easy preload adjustment. adjustable flaps, covering a range from very low downforce to very high downforce. Only one main front wing for all conditions. Bodypost attached to the frontwing. in 3 vertical positions, and free to place horizontal position, which can easily be changed with one hex wrench, as the screws go into a threaded alu endplate. In addition the upper rear wing flap can be adjusted in three positions.